A Cooperative Builder and Innovator with Heart - Bigelow LLC. I was looking for some light reading earlier this year after devouring all of Gillian Flynn’s works, and wanted to stick to the murder / mystery genre, when I stumbled upon the Max Tudor Book Series by G.M. Malliet. The series centers around a former MI5 agent trying to bury his past now that he has become the vicar of St. Edwold’s, located in the idyllic village of Nether Monkslip on the Southwest coast of England. Despite his conscious life choice to distance himself from his past of violence and secrecy, murder still seems to follow him. 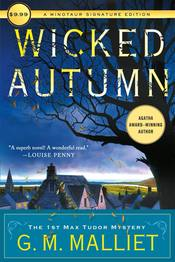 In the first book of the series, Wicked Autumn (Chivers, 2011), the much-disliked and very outspoken head of the local Women’s Institute is found murdered at the annual Harvest Fayre. While at first thought to be an accident, Max’s years of MI5 training tell him otherwise and quickly find him caught up in the middle of the investigation. G.M. Malliet does a wonderful job describing the quintessential small English village filled with its unique cast of characters and will have you wanting to learn more about them and the charming protagonist while watching him practice his old craft in new circumstances. -Jay Jacobs, parallel entrepreneur, Founder of Rapid Manufacturing (acquired by ProtoLabs) and Paperless Parts, speaking about the challenges of building an enterprise for the really, really long-term through the natural evolutions (and revolutions) as it grows and matures. When the alarm goes off at 5:15am, it doesn’t feel particularly energy creating, but when I finish my trail run around 7.00am I am positively buzzing with energy. Every Wednesday and Friday at 6am, year-round, a group of 4-5 runners from my town hit the trails. It’s only a six-mile loop, but frankly the run is secondary. The social component, the banter, and the time to reflect and think is what makes it so worthwhile — and energy creating. I do some of my best thinking out on the trails. This time of year, it is pitch black, so we run with headlights through the woods of Boxford, MA. Rain, sleet, snow, freezing temperatures — we are out there. It is habitual. Friday (the 21st) will be the shortest day of the year – a huge milestone for our little running group. It will gradually start to get a little lighter each time we run, and a little easier to roll out of bed when that alarm goes off.